Demand for cannabis real estate grows massively in Canada. Cannabis real estate in Canada is set to grow with the pending legalisation of cannabis in the country. With the industry set to boom, the biggest cannabis companies will need to expand. The will need to keep up with demand and need more than 8 million square feet by 2020 for distribution centres across the country. So industrial land will be hotly pursued to grow operations quickly. Once recreational becomes law, they will have to keep up with the added demand from recreational weed users. Currently Canada has around 85 weed companies worth around $30 billion combined. This is set to grow at a rapid rate, which will also mean employment for Canadians. This demand will add pressure on finding suitable industrial land in a market that is already booming. The cause of the real estate boom is the huge move by people to shopping online. So, organisations need warehousing space to hold their goods. Experts predict the end of recreational cannabis prohibition will have a bigger impact than the end of alcohol prohibition. There is a high level of people and real estate required to setup a new marijuana industry across Canada. This is great news for the owners of industrial properties, but these will be hard to find. The demand for high yielding potent strains from BC Seeds has also seen most of their genetics sold out the months. It’s never been a better time to be a reputable seed bank in Canada. With Canadians turning to online shopping, industrial space is already at a premium. Vacancy rates are at their lowest since 2001 at 3.9%. According to real estate specialists, Cushman and Wakefield, rents have gone up. By 15% Toronto 15% and 7.3% in Vancouver, caused particularly by Amazon online shopping. And, now there is the very real prospect marijuana will be legal later this year. But, properties are now hard to find. There is a lesson Canadians can learn from Portland, Oregon. Demand pushed rents up in Portland to between $12 and $18 per square foot for industrial space for cannabis. Compare this to the normal rate of $5 a square foot in the area and this is expensive. And, in Colorado, cannabis producers are paying up to 10 times the going rate to secure the space they need. Canadian cannabis growers are taking a different approach to their American neighbours. Aurora Cannabis chief corporate officer Cam Battley said the company build their own facilities from the ground up. This is so they can control all the variables of their operation. Canopy Growth is the largest public company trading in cannabis across the world. Where Canopy Growth used to look for large industrial spaces, they have changed tactics. Now they look for large greenhouses instead or warehouses to control costs. Before marijuana is even legal, there is a race for the best industrial real estate space in Edmonton. While it is not possible to predict the end outcome, it is possible to compare the results of legal weed in other cities. Denver had weed legalised in 2014, and the market indicates growers are paying up to three times the normal rate for industrial leases. In a short time, only three years, marijuana is responsible for 3% of Denver’s industrial real estate market. Owner of industrial buildings are taking full advantage of the demand and are cashing in. 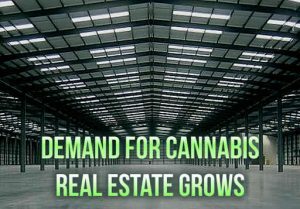 The demand for cannabis real estate is insane. It’s growing faster than many entrepreneurs predicted. Ganjapreneurs caught off guard pay higher rents, earning reduced profits. With Edmonton’s industrial vacancy rate increasing over the years, it is currently sitting at around 6%. So, real estate agents and property owners expect to see a healthy industrial real estate market when recreational cannabis becomes legal later this year. But, whatever cannabis companies do, there will still be an impact on the availability of industrial space over the long term. 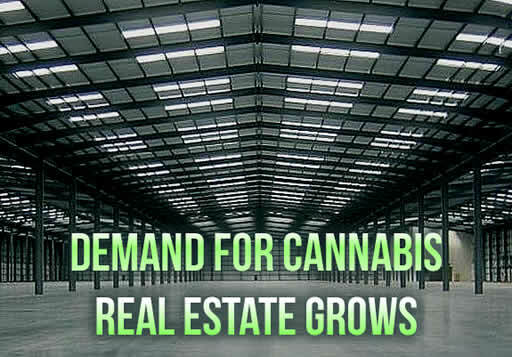 Demand for cannabis real estate grows in 2018 and there is no reason for it to stop anytime soon. Are their real estate companies in Canada that deal specifically with land that has the zoning and HC approval?